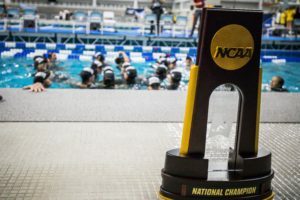 As we approach the women’s NCAA Championships, one of the most interesting and perhaps impactful events is the final event: the 400 free relay. We’ve maintained in our Power Rankings through this season that Cal, Michigan, and Texas are bunched up in a race for 2nd in the team battle. 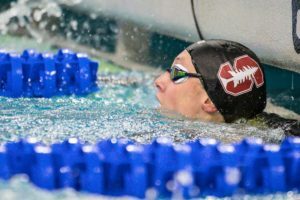 Regardless of whether Stanford is actually beatable this year or not, if things are as tight as we expect them to be, the 400 free relay could prove to be quite consequential in the team battle. Stanford has won this event 4 of the last 5 years, but they do not appear to be a favorite to win this time around. 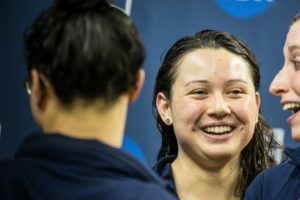 Afterall, Cal took down Stanford’s NCAA record from 2017 at Pac-12s, a record in which that relay team consisted of an Olympic Gold medalist in the 100 free (Simone Manuel) and an Olympic Silver medalist in the 400 free relay (Lia Neal). 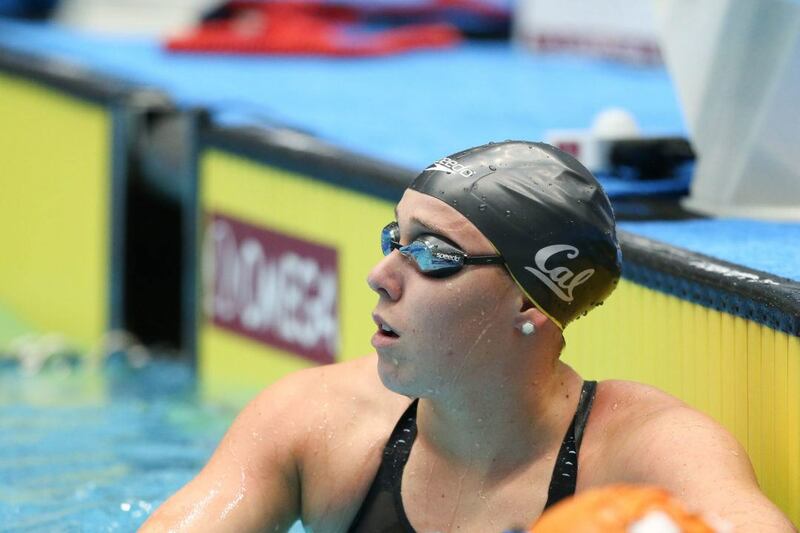 While we knew Cal would be fast in the 400 free relay this year, especially given how well Abbey Weitzeil has been swimming, that Pac-12 relay was still shockingly fast. The only question that remains now is can this Cal squad re-make their Pac-12 magic? They should be able to, at the very least, since there’s no reason to think that Abbey Weitzeil, Amy Bilquist, or Katie McLaughlin would have peaked for Pac-12s. 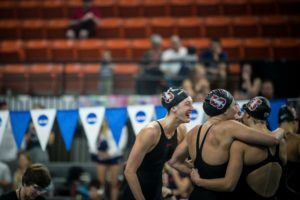 But on the other hand, relays can be unpredictable, and this one comes at the very end of a meet, so it’s possible they won’t quite reach their time from Pac-12s. In case you need a refresher on the Cal 400 free relay from Pac-12s, here’s what you need to know: Robin Neumann led off in 48.17, then Katie McLaughlin split 46.55, Amy Bilquist split 46.30, and Abbey Weitzeil split 46.39 on the anchor. They swam a 3:07.41 for the fastest yards 400 free relay in history. Cal is not going to get to just stroll to the NCAA title in this event however, as they should get a good race from the Texas Longhorns, who finished 7th in this event last year. The Longhorns were the first team to break 3:10 this season, back during the mid-season invites, and they might be the only other team with a good chance of having three legs split under 47 seconds. When the Longhorns went their 3:09.56 seed time back at the Texas Hall of Fame Invite, Claire Adams led the squad off in 47.32, while freshmen Grace Ariola and Julia Cook split 47.17 and 47.25, and senior Anelise Diener anchored in 47.82. It’s rare for a team to have its best time in a relay come from the mid-season invites, so there is good reason to believe Texas will be faster than their seed in this event. We should still keep an eye on Stanford, the two-time defending champions. 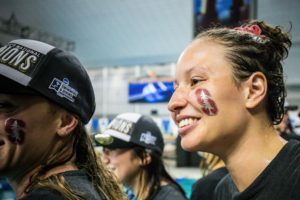 Losing Simone Manuel and Janet Hu are big hits, but they reloaded with our #1 ranked recruit for this freshman class: Taylor Ruck. Ruck led off the Stanford relay at Pac-12s in a very fast 46.76, and we can only guess what she’ll do if she leads off at NCAAs. 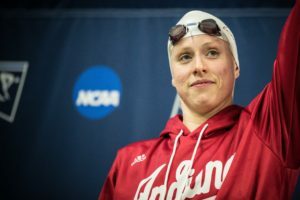 Ella Eastin and Lauren Pitzer have posted some speedy 100 splits in their careers, and if they’re posting career best splits at this meet, Stanford will be a real threat. It’s unclear exactly who will be the 4th member of this relay. Katie Drabot was on it last year, splitting a 47.8. Freshman Anya Goeders has been fast so far this season too, and could make her way into the 400 free relay squad. Michigan and Auburn are in the mix as well, each having swum faster this year than they did at NCAAs last year. Michigan is being helped by freshman star Maggie MacNeil, who is proving to be maybe the biggest breakout freshman in the NCAA this season, and Catie DeLoof, who has had a breakout season of her own in her senior campaign. Siobhan Haughey will be providing some serious speed wherever they put her, and Daria Pyshnenko, who was on the Wolverines’ NCAA relay last year, looks like she could potentially split under 48. Auburn has a fast pair of 100 freestylers to help them on this relay, Alyssa Tetzloff and Claire Fisch. Tetzloff was an A finalist in the 100 free last year, and Fisch appears to be well seeded to score in the 100 this year. Moreover, Julie Meynan provided a 47.54 split at SECs, which would be gigantic for Auburn if she can duplicate it at NCAAs. Between the three of them, Auburn has a very solid foundation for this relay to be successful with. Perhaps the team with the biggest question mark around them is Louisville, who came in 4th in this event last year, and return the exact same relay. Louisville, however, has not yet looked quite as fast as last year so far this season, despite not losing any key players. 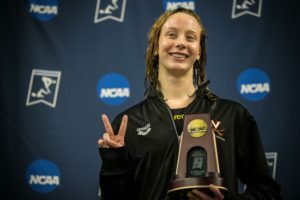 Mallory Comerford will of course be instrumental in Louisville’s relay, and she could really put them in a good position depending on where they use her. If they can manage to outperform their time from last year (3:10.53), they will be right the mix of Michigan and Auburn, and maybe even Stanford. Virginia was 3rd in this relay last year, but they lost their two fastest splits from that relay, Laine Reed and Caitlin Cooper, who each split 47.40. They still have top 8 potential, since Kyla Valls split a second slower at this year’s ACCs than she did at NCAAs last year, and just her getting back to last year’s split should be enough to boost UVA into the A final. Megan Moroney and Eryn Eddy have been added to this relay as well (replacing Reed and Cooper), and they could very well be faster than they were at ACCs. They’ll battle with Tennessee for the last spot in the A final. The Volunteers were 6th last season in this relay, and they return all 4 legs from that relay. Stanzi Moseley will need to be better for the Volunteers than she was at SECs, though, for them to fulfill that prediction. This is the second article I’ve read from this contributor in the past two days, and both of them could really use a strong edit, to put it kindly. 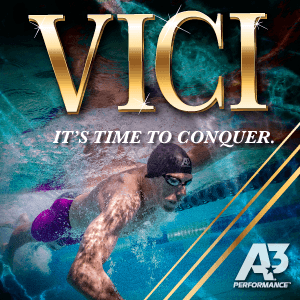 I enjoy Swimswam for both the content and the near professional quality of writing, but these articles fall *far* short of the usual standard. 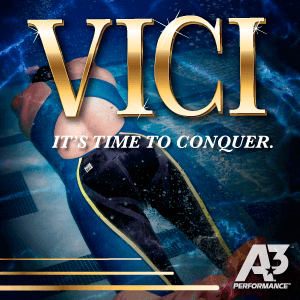 It would be great if one of the more established Swimswam writers could help Spencer get up to speed by taking a look at his/her articles before they get posted to the site. I found the article insightful. Could you provide some examples of where he falls short? I find this article to be carefully researched and well written. Hard to dispute Hawaiian Reeves when the receipts are so accurate. . .
Who are Brendan or Lauren? Can’t find these names in the list of contributors at the bottom of the page. it might have been better to just send a private email to swimswam email account than to post it here. Are you an English teacher? Except Indiana and NC State are pretty good. Sorry but it won’t be a “fierce battle” between Texas and Cal. But I am really impressed with Texas’ step forward this year.